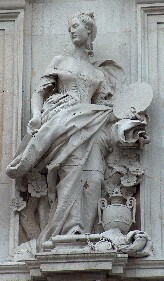 One of a pair of angels by Poole on Methodist Central Hall . The sculptor Henry Poole attended the Royal Academy Schools from 1892, and afterwards trained under Harry Bates and G. F. Watts. 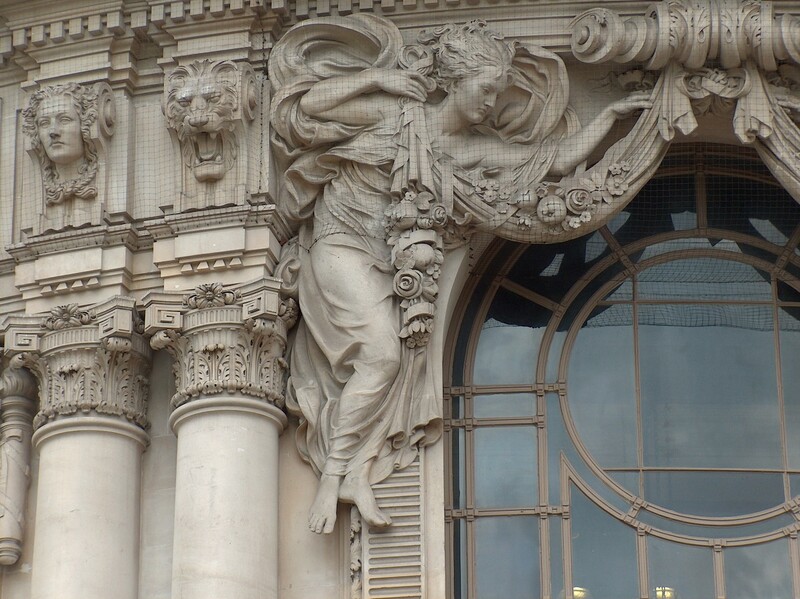 His own father had been an architectural carver, and much of Poole's work was architectural sculpture, particularly for buildings by the architectural partnership Lanchester and Rickards. 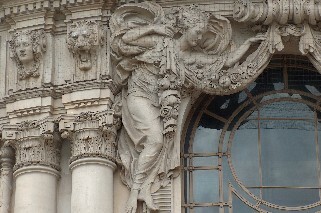 Among his works for them include a group for Cardiff City Hall ( Patriotism and Unity - noted on this page), decorative sculpture for Deptford Town Hall, the work for 144-146 New Bond Street, and the elegant high relief spandrel figures of angels for Methodist Central Hall, Westminster, shown above. Minor work by him is close by in Great Smith Street (see the walk on this page). In Bristol is Poole's statue of Edward VII - in front is an excellent fountain with mermaid, merman etc, also by Poole, described on this page. Alas, much else by Poole seems to have been destroyed along with the buildings he adorned. Poole was elected ARA in 1920, and became full RA in 1927, an honour which he did not live long to enjoy. Poole’s figures, mostly girls, are elegant, symmetrical, perfect creatures, mostly in white marble or stone, and with a certain hardness of aspect which makes them remote rather than sympathetic. The faces as a whole have a breadth of forehead and chin, and the bodies can be rather muscular. All this gives the feel of the Valkyrie to the Poole girl. Nevertheless, they may also sport long, elegant necks and complex hairstyles, to give an air of sophistication, as in the figure below.